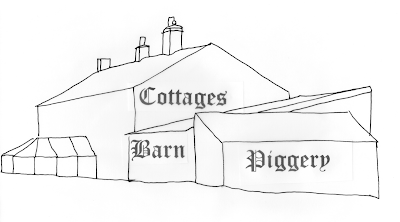 The existing cottages have three original king post roof trusses that date back to the 1700’s. We have replaced the tie beam on the middle cottage and then replaced 6 purlins through the 3 cottages (2 were later replacements and 4 were cracked). We have used reclaimed oak with all the replacements to ensure that it matches the existing timbers. In addition, we replaced around 50m of wall plate (this is timber that runs along the top of the wall and carries the ends of the rafters). Other than that the existing oaks timbers were simply sandblasted to clean off the years of muck. They will be treated with a wood preserver later. 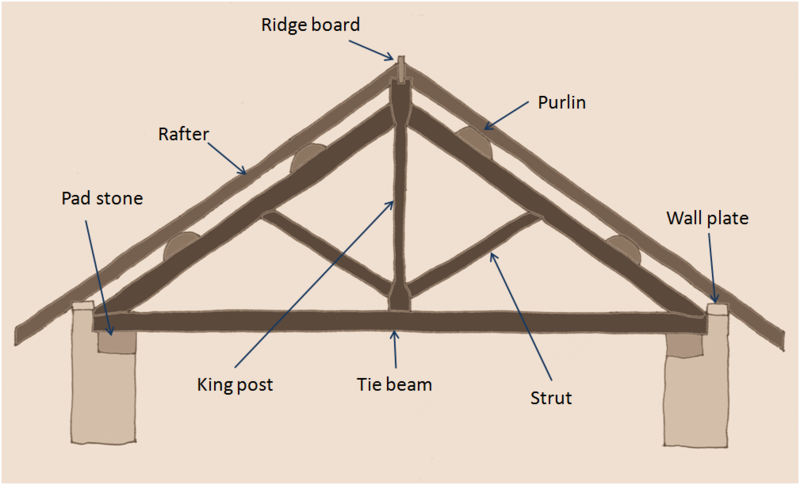 A traditional King Post roof truss. This is the configuration that we have in our property. There are three in the existing properties. I have started working in the top corner of the orchard. On Day 6, I dismantled what was left of the existing wall and it is amazing how much stone can come out of such a small section of wall, particularly when many of them are deeply embedded in the ground – they must have fallen off the wall many years ago. 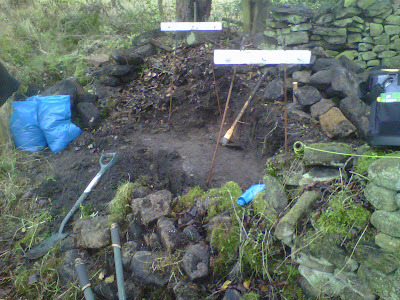 So Day 7 started with digging out the foundations. This involves removing all of the stones down to the subsoil – you can tell when to stop because the soil changes colour. All dug by hand with a pick and shovel. 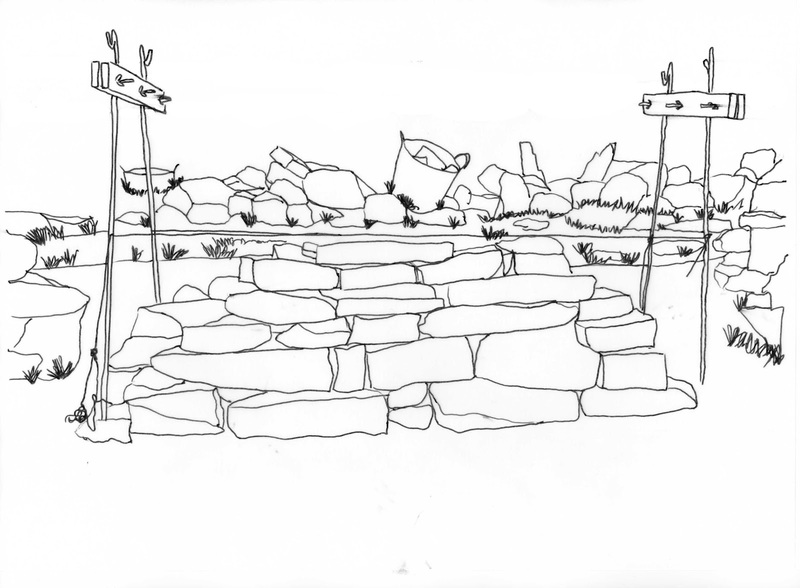 I established the route of the wall by using a line along the existing part of the wall. You can just see the yellow line in photograph above. Once this is worked out, I put up the two end frames that define the angle (referred to as “batter”) of the wall – 600mm at the base of the wall and 300mm at the top of the wall. The wall is 1 metre high (well, when measured from the other side of the wall that is lower. Once the foundations are dug, it is time to build the wall – one layer at a time. At the end of Day 7, the first metre of wall is up and the coping stones are now placed on top. The plans have now been submitted to the local planning department and although the 3D drawings are not part of the planning process, they do provide a clue to what the building will look like when finished. You can see the main building is left pretty much as it is today (although minus the conservatory). The barn on the end has become the corner of the L shape which is then extended out for the lounge and the master bedroom. The roof line on the extension stays constant even though the ground rises upward. The rooms inside flow when the natural rise in the land. The garden area is split into two distinct spaces – a lower garden accessible from the lounge and a higher garden accessible from the master bedroom. 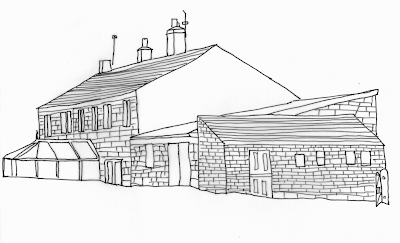 The roofline in the extension is at a lower level than the main house (pretty much as it is today) to give a clear separation between old and new. Well after the progress made yesterday – wall dismantled, foundations dug and first course laid – today was somewhat disappointing. Disheartening even. 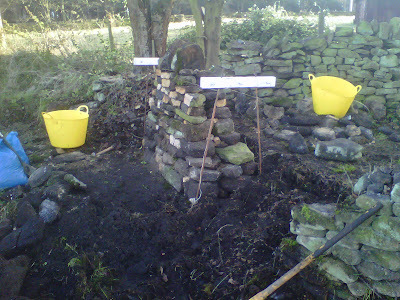 In 4 hours, I managed 6 or so courses and the 2m section of wall I was working on reached about 0.5m, maybe less. 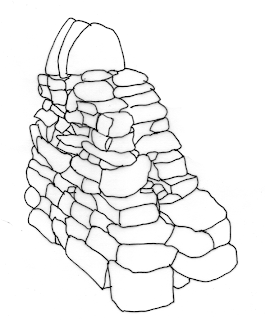 The main problem (besides my lack of skill) is that most of the stones that make up the wall are pretty much rounded boulders. 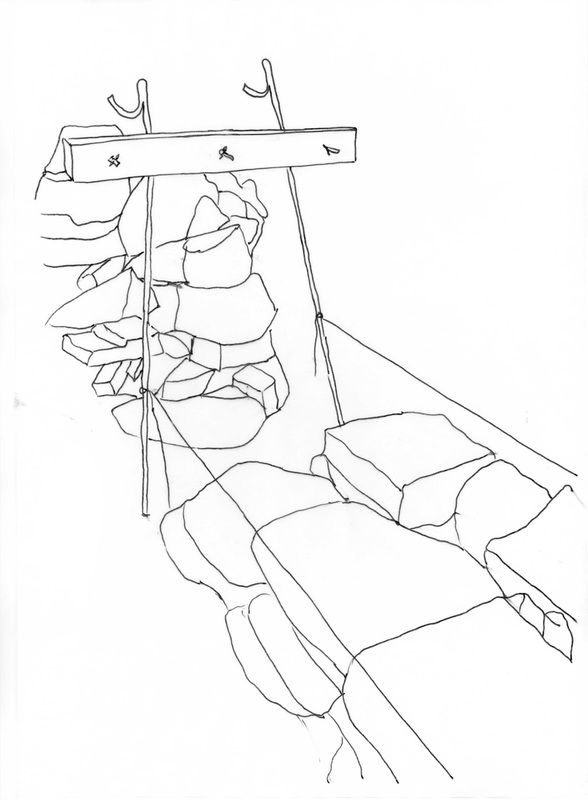 The rock is made up of very coarse gritstone which is very soft and crumbly – you could try and shape it with a hammer, but that is going to be real hard work. So what do you do? In short, no idea. Looking at the surrounding fields, the same problem is present – walls (or what used to be walls) made up of rounded gritstone. There are some walls on the property that are made from a much finer sandstone and the stones here are much flatter with defined angles. I would imagine that the stone for these walls has been brought in from elsewhere, but probably not too far away. 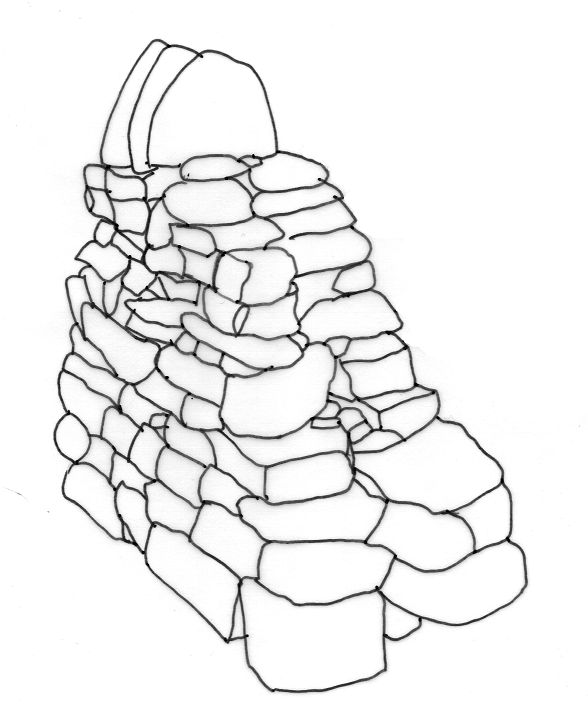 Option 1: Bring in building stone and remove the old boulders. This isn’t going to work. The new stone would cost a fortune to buy on this sort of scale, plus what would you do with the old stone? 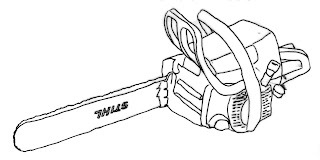 This seems like a sledge hammer to crack a nut. Option 2: Rebuild the wall using the existing gritstone. Improving the wall isn’t going to be hard as part of it has fallen down and even if it hadn’t, it could do with being straight! It won’t be perfect, or pretty for that matter, but it will do the job. Since the wall does have some building material in it, I could sort these stones out and use them to repair some of the walls nearer to the house. ﻿As far as I can see, Option 2 is the only real practical solution. I could do with getting some advice from someone with a lot more experience than me. Just in case I am missing something obvious – it is a lot of work for some to then point out that there was an easier solution! The next step has to be looking at the other field walls and finding a section that is relatively intact. This will give an idea of the size and proportion of the walls. I can then see if we can build something that is similar. Ho hum.